I feel as though I’ve completely neglected this blog! Apologies! As mentioned in the posts below – I’ve just started a new job and moved into a new apartment, so I’ve been busy! And not inspired to make anything new…yet. As a result, my pictures have been carefully cropped and edited and they are enormous if you click on them. Sorry. 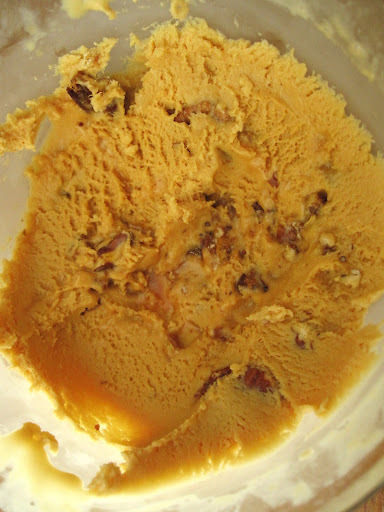 Before all the madness, I did make this lovely butter caramel ice cream, c/o the recipe from David Lebovitz, which can be found here. I have to admit – I am afraid of caramel. I’ve had it burn and crystalize on me before, so I’m familiar with the all-too common caramel catastrophes. But recently, I’ve had a run of good luck! And Mr.Lebovitz uses the ‘dry caramel’ technique – which is basically sugar, SANS water or any other element. And it worked great! What I didn’t like about the recipe is that you pull the caramel off at a certain colour – and I’m very faithful to my candy thermometers and temperatures, so it was difficult for me to ‘determine’ what was the best colour according to his directions. I think it was pretty close. I also used the ‘dry’ technique to make candied toasted pecans. Yum. Ooh. I have a picture of the spatula with strands of caramel coming off of it. Will post soon. I promise.